Dog aggression is something that should be taken seriously because when a dog threatens, somebody, including your dog, can physically get hurt and that is something that you would not want to happen. If you notice that your dog is starting to show signs of aggression by growling or snapping at other people, you need to act on it immediately. Yours is not an isolated case. Many pet owners have experienced seeing their dogs lose their cool and act aggressively around people, and even around other dogs. Like humans, dogs also have emotions and they have the tendency to dislike people because of reasons that no one can explain. But, if we can control our emotions to avoid conflicts, dogs cannot. Dogs show their aggression towards the other parties through different ways and a couple of those ways are growling and snapping. It is important that you know what triggered your dog’s aggression. Take your dog to the veterinarian and have him checked for any illnesses or injuries. Sometimes, when dogs are hurt, their defense mechanism is to be aggressive to hide their pain. They do this to ward off anyone or anything that might potentially hurt them even more. They show aggression instead of showing any signs of weakness. On the other hand, if your dog is not in pain and the veterinarian could not find anything wrong with it in terms of its physical health, then you might want to consider a specialist on animal behavior. Your dog may be going through a temporary phase and if not addressed correctly and immediately, it may develop into a long-term problematic behavior. However, keep in mind that sometimes, dogs growl when they are uncomfortable or when they are scared of something or someone. Aside from pain, growling or snapping can also be a sign of fear. Your dog may be growling or snapping in the presence of particular people because they remind your dog of a negative experience. Dogs may also growl or snap towards people whenever they feel that they need to protect something. If you have not noticed, dogs who just gave birth have the tendency to growl and snap more often because it is in their nature as mothers to protect their puppies. 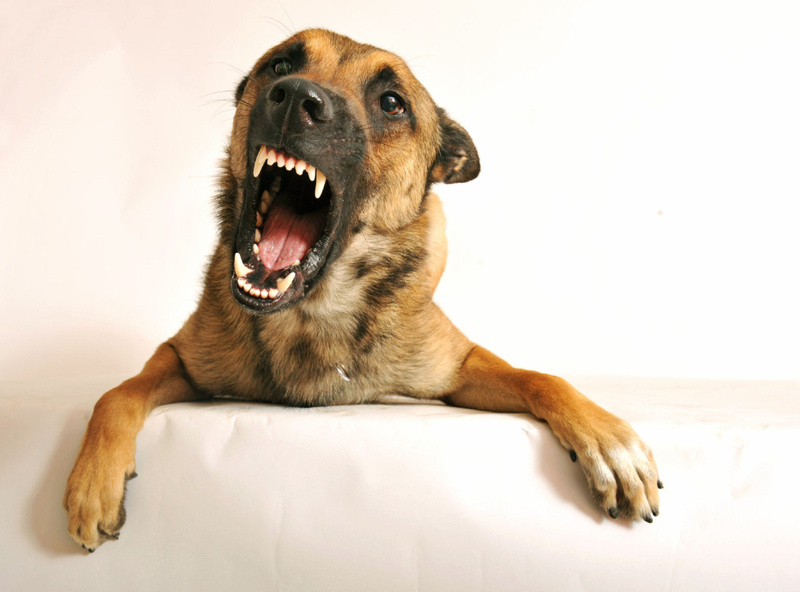 Correcting your dog’s aggression may be challenging, but it is doable. It is easier once you are able to determine the reason for the aggression. Depending on the trigger, you can try the following recommendations and adjust accordingly on what you think will work best. If your dog is growling because of pain or an illness, give him the proper treatment. Once your dog feels better, he will also most likely stop growling because there is no more need for it. Eliminate the stressors to avoid triggering an aggression from your dog. Avoid taking your dog out in crowded places as unfamiliar faces and noise can agitate your dog even more. However, it does not mean that you should isolate your dog. Just be cautious and take it slow when introducing him to a new environment and new people. Use a muzzle for safety and as a warning for people not to get too close and to keep themselves and their dogs at a safe distance from yours. But still, make sure that your dog feels comfortable. Your dog should still be able to open his mouth to pant and should not be left unattended while wearing a muzzle because he may try to remove it and injure himself in the process. Enroll your dog in a dog training center such as Sit Means Sit. It is one of the largest pet training centers in the US and they are known for their dog behavior modification training. Your dog might need to undergo obedience training to align his behavior and teach him how to behave well. You need to be patient and positive in dealing with your dog. Do not punish your dog because it can just make things worse as he may resort to biting in order to defend himself. Sometimes, growling and snapping serve as a warning that he is uncomfortable, feeling pain, or is in fear of something or someone. If you punish him for the warning, he may skip that stage next time and just go straight into action. Your dog does not need to be punished, hit, and yelled at. He needs to be helped and corrected.